The evil organization SPECTRE steals two warheads from NATO and demands 100 million pounds for their return. James Bond (Sean Connery, Marnie) travels to the Bahamas where he suspects the weapons are kept. 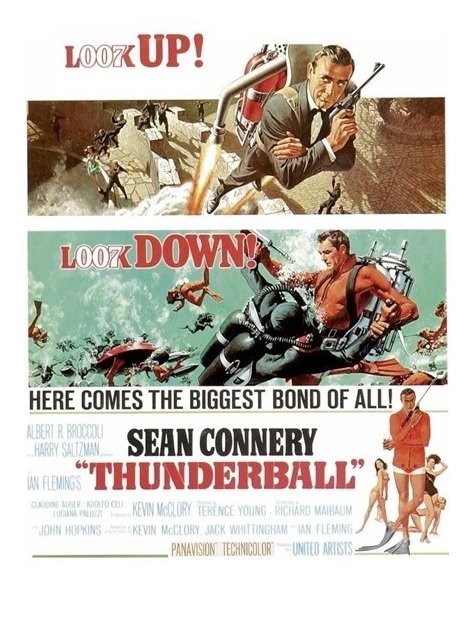 Thunderball is a bit of a letdown — the film isn’t as good as any of the three films that preceded it. I just don’t love it the same way I love Dr. No or Goldfinger. That being said, this is a case where the good outweighs the not-so-good. Maybe because both movies take place in the Caribbean, Thunderball kept reminded me of Dr. No (1962). Interestingly, Thunderball was supposed to launch the series, but the producers decided to go with Dr. No instead. There is no denying that this is a super-production with many eye-catching sequences. Thunderball opens up with an admittedly thrilling pre-title sequence. However, the film’s best section consists of some excellent underwater footage — the underwater battle between the good guys and the bad guys is very exciting to watch! This is the first film in the series shot (by Oscar-winning cameraman Ted Moore, A Man for All Seasons, The Prime of Miss Jean Brodie, etc.) in widescreen and the wide-angle lenses give the movie the necessary visual kick that such an elaborate, expensive production screams for — Thunderball does look great! The film also sports many cool-looking visuals (the movie won an Oscar for Best Visual effects). The supporting cast is strong. Italian character actor Adolfo Celi (Von Ryan’s Express) is good as baddie Largo (his voice was dubbed by Robert Rietty). Although a true psychopath, Celi’s Largo is clearly not as interesting nor as charismatic as previous super-villains like “Dr. No” and “Goldfinger,” but he’s scary enough. Luciana Paluzzi (The Green Slime), who plays the cold-blooded Fiona, is the best thing about the film, though. Claudine Auger and Martine Beswick (she had played a different role in From Russia with Love) are gorgeous “Bond girls.” I loved the fact that ‘M” (Bernard Lee) and “Moneypenny” (Lois Maxwell) have much more screen time than usual — they appear throughout the whole movie, something that won’t ever happen again. Ken Adam (Dr. Strangelove and Barry Lyndon) creates some truly fantastic sets. Adam’s most eye-grabbing creations are NATO’s headquarters and mastermind Blofeld’s futuristic lair. The title song is perhaps my biggest disappointment — after the bombastic song in Goldfinger (1964), you are left wanting more, much more. Thunderball is good, but not top-tier Bond. Unfortunately, the movie lacks the smoothness of the previous entries in the series. I did enjoy it and will recommend it to fans and non-fans. In a strange twist of fate the rights to the story went back to executive producer Kevin McClory, which enabled him to remake the film in 1983 as Never Say Never Again (1983). Color, 127 minutes, Rated PG.